If you're a mobile player, then you can earn double points at Jackpot Capital Casino during their most recent promotion. A total of $162,500 is being given away in the Jackpot Capital Casino "What Happens in Vegas" special promotion, and no matter what kind of volume you have with their games, you can still qualify for some great prizes. The whole thing revolves around earning points, and mobile play earns twice as many points as playing from your computer. This is a leaderboard competition, so the players with the highest scores in terms of promotional points will be given prizes. Each Monday, the points will be totaled for the past week, and prizes will be awarded. First place earns $800, second gets $700, and third is given $650 for each Monday payout. Places fourth through tenth will be given $500 each, and 11th through 20th will earn $300 apiece. The prizes keep going down until they level off at the $20 point, but a total of 350 players will be given a prize each week. This means that you have some excellent chances of winning even if you're just a casual player, and this chance is doubled if you play using the mobile software. Here's what you need to do to qualify. In the week that you want to earn points towards the leaderboard, you'll need to deposit at least $100 total. You earn one point for every $45 that you deposit during that period, and you earn another point for every $100 in real money wagers you make on the downloadable software. As you might expect, it's two points for every $100 in real money bets placed in the mobile software. A total of $30,000 will be given away each week to lucky winners on the leaderboard. 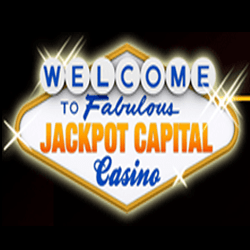 Jackpot Capital Casino has plenty of games for you to choose from. They use titles from multiple software developers including Realtime Gaming to give you exceptional titles to choose from. With such a good selection, you'll have plenty of options when it comes to running up points for this leaderboard promo. Their mobile options include classics like Aladdin's Wishes and a mobile-optimized version of blackjack, so no matter if you prefer slots or table games, you're going to be covered.